Intel said Tuesday it was expanding its operations in Israel, where government ministers said the US computer chipmaker will invest nearly $11 billion in a new plant. 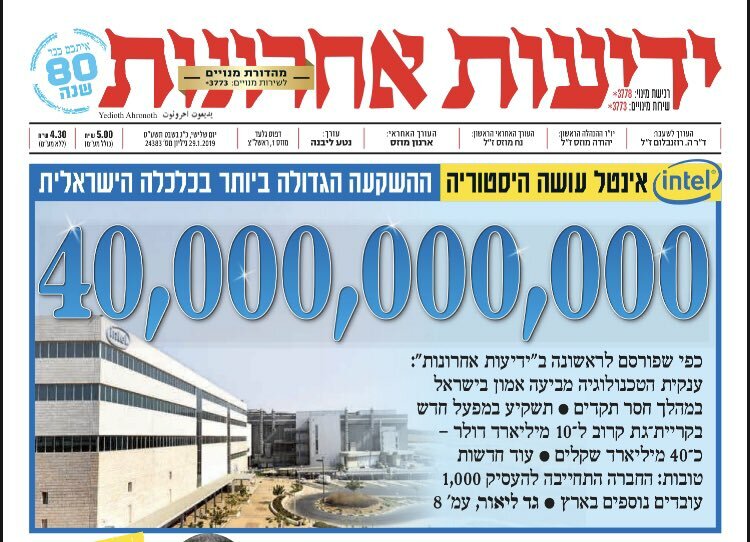 “Intel today announced it will submit a business plan to the government of Israel for continued investment in the company’s Kiryat Gat manufacturing site,” a statement from Intel’s Israeli representatives said. The tech giant said it would not comment on schedules, costs and technologies of the project. Without Tlaib’s “They forgot what country they represent” smear, Senator Marco Rubio’s response doesn’t make sense. Alice Walker, David Icke and the New York Times: Studies in the Mainstreaming of Paranoia. The following essay was written by Michael Barkun, a colleague in millennial studies who’s written a book with extensive treatment of David Icke. He wrote a letter to the NYT about their Alice Walker interview which the NYT did not see fit to print. Here’s a more substantial treatment, he’s offered to the Augean Stables. And the Truth Shall Set you Free, by David Icke. In Icke’s books there is the whole of existence, on this planet and several others, to think about. A curious person’s dream come true. Like many others, I was shocked by Walker’s reading preference. I had written extensively about David Icke in my book, A Culture of Conspiracy: Apocalyptic Visions in Contemporary America, and knew that not only the book she mentioned but Icke’s many others were laced with vicious anti-Semitism, along with bizarre ideas drawn from occultism and science-fiction. The published reaction to her interview came in two forms, one from the Times, the other from Walker herself. The Times’ initial reaction suggested that it was taken aback and befuddled by “The many readers [who] have expressed concern…” Rather than let the controversy play out in the Book Review’s letter column, on December 20th it devoted an “Inside The Times” article – traditionally placed on page 2 – to an attempt to explain what had happened. “Readers were upset,” the Times wrote, “that we didn’t add context to Ms. Walker’s endorsement of Mr. Icke…” In a lengthy Q-and-A format – ironically similar to that of the original Walker interview – “Inside the Times” explained at somewhat tedious length that “By the Book” interviews were in fact conducted by email and that they were only minimally edited. Head of ADL Jonathan Greenblat was slammed for lauding a statement by Minnesota Congresswoman Ilhan Omar [Dem] in which she distanced herself from allegations of antisemitism, claiming in a Tweet from January 22 that she used an "antisemitic trope" unknowingly in 2012 when she said during a CNN interview that "Israel has hypnotized the world" to carry out "evil." "Hats off to Rep Omar for her honest apology," Greenblatt wrote, before saying she is committed to "a more just world." Omar never apologized for calling Israel “evil” and an “apartheid regime,” said the ZOA in a statement on Monday. "Rep. Omar lacks credibility and her weak words of 'apology' can’t be taken seriously. ... ZOA believes that it is a serious mistake for ADL/Greenblatt to accept Rep. Omar’s limited 'apology.'" Hundreds called on Omar to resign when it became known she called on US District Judge Michael Davis to show "compassion" during a 2016 trial of Somali-American men who planned to travel to Syria and join ISIS to fight and kill for radical Islamic values. Eventually all men were given a sentence of at least 15 years, the Daily Mail reported. This week, journalists and experts slammed Omar for her comments appearing to back Nicolás Maduro's regime in Venezuela and warning against a US backed coup in that country. It doesn’t matter that when the Second Wave of feminism was formed Jewish women at its helm were considered ethnic. They are now retroactively white, and we need women of color in feminism. Jews are more than white. When The Forward‘s reporter went to a Black Movement Center to talk about the recent wave of attacks on Jews by blacks in greater New York, he was told that Jews are now seen as hyperwhite. Never mind that the victims of the Jew-haters are often Bukharan, and likely haven’t set their foot on the European continent. As Abe Greenwald explained, Jew is what you don’t like, only more so—in this case whitey. When comrades informed Sobel that she doesn’t get to be a person of color, instead of trying to employ the language of intersectionality, talk of being revicitimizied, or harmed, oppressed, and dismantling power structures, she should be mindful of the power structure within which she works: the power structure that gave us Tamika Mallory, Linda Sarsour, and Ilhan Omar. She should remind those around her that race is a social construct of limited usefulness. That, for instance, affirmative action privileges middle class blacks and nearly dooms working class Asians. According to all available data, anti-Semitism in the United Sates is more pervasive among minorities. This is not surprising. Instead of encouraging these groups to think of themselves as victims, Jewish leftists should blow up the paradigm of intersectionality. Many American non-whites bring their pre-existent Jew-hate into intersectional organizations. Look no further than the Women’s March co-chairs. Affirming their grievance-centered worldview runs the risk of affirming anti-Semitism along with it. Why expect radical black nationalist groups to jump to our defense when their views ally more with those of neo-Nazis? Progressive Jews might just be digging our grave. Besides, our own experience teaches that the way to get ahead in a republic like ours is not by nursing grievances, but by boring things, like honest hard work. Our natural allies are not intersectional activists and their flak, but hard-working people of any skin color. An anti-Israel protest has again led to controversy at Creating Change, an LGBTQ conference that was the site of a raucous anti-Israel protest in 2016. At the opening of this year’s conference, organized by the National LGBTQ Task Force, a group of activists holding Palestinian flags took the stage unannounced and led a 13-minute protest for Palestinian liberation and against Zionism. The speakers were not interrupted or asked to leave by the event organizers. The conference took place from Jan. 23 to 27 in Detroit. The first speaker of the protest, who did not give their name, said the conference did not include pro-Palestinian programming because it could upset donors. The speaker invoked Rep. Rashida Tlaib, the Michigan Democrat who is the first Palestinian-American woman elected to Congress. A veteran Polish swimmer has rejected an offer to coach Malaysia’s national swimming team, citing Kuala Lumpur’s recent refusal to grant visas to Israeli athletes, which has caused the International Paralympic Committee (IPC) to strip the country of the right to host a major swimming event. In a Facebook post, Bart Kizierowski — who represented his country at four Olympics — explained his decision to turn down the job. “I was offered a very attractive coaching position from the Malaysian Swimming Federation,” the 41-year-old wrote. We recently covered the story of a Palestinian-American who was sentenced by a Palestinian court to life in prison for selling property to Jews (he later was released after U.S. pressure). Other Palestinians have been murdered for similar actions. Airbnb came under intense criticism for its actions from Israel and pro-Israel politicians in the U.S. There also have been lawsuits and arbitrations filed on the basis that Airbnb’s actions are anti-Jewish discrimination. I predicted that Airbnb would try to ride out the storm, figuring it would go away. In December 2018, it appeared that Airbnb was backing down, but it later claimed the statement indicating a reversal of the boycott was released in error. To the contrary, Airbnb recently issued a statement confirming that it was boycotting Jews in the West Bank. As a fig leaf, Airbnb also announced that it was delisting homes in two other “disputed areas,” South Ossetia and Abkhazia. That fig leaf may do more harm than good to Airbnb’s legal defenses, because only in the West Bank does Airbnb distinguish between home owners based on religion or ethnicity. If Airbnb was delisting all homes in the West Bank, that would be one thing, but instead it is delisting only Jewish homes. In contrast, the Guardian published a mere 21 photos depicting the Syrian Civil War over the same 10 month period. To get a sense of the scale of this imbalance, note that the Gaza riots have claimed 209 Palestinian lives, whilst roughly 16,000 Syrians died during that time, with another 800,000 or so driven from their homes (extrapolating from 2018 totals as reported by the Syrian Observatory for Human Rights). Additionally, whilst four photos from the Gaza riots were used by Guardian editors as their featured photo of the week, no Syrian photos were featured. Here are the 31 photos from Gaza – most of which, as you’ll see, clearly portray the rioters in a sympathetic, even noble, light. The Polish government marked International Holocaust Remembrance Day on Sunday, but completely ignored the complicity of Poles who actively participated in crimes against Jews during World War II. Historians debate how many Poles aided the Nazi death machine during World War II, with estimates ranging from tens of thousands to hundreds of thousands. But Poland has never admitted to complicity on any large scale and last year Warsaw passed a law prohibiting people from blaming the Polish nation for Holocaust atrocities. Polish prosecutors opened an investigation Monday into an anti-Semitic protest by dozens of far-right nationalists outside the gates of Auschwitz. The incident took place on Sunday, in Oswiecim, the southern Polish town where Nazi Germany operated Auschwitz during World War II. It happened as Holocaust survivors gathered nearby to commemorate the anniversary of the camp’s liberation, a day also recognized each year as International Holocaust Remembrance Day. Mariusz Slomka, a deputy district prosecutor in Oswiecim, said Monday that prosecutors are investigating. In Poland, it is a crime to incite hatred based on religion or race. A nearby driver yelled obscenities and anti-Semitic remarks as members of a church in California walked to mark International Holocaust Remembrance Day. About 100 members of the Church of Jesus Christ Temple Philadelphia in Salinas, California, had gathered on Sunday after services in the church parking lot to get ready for an annual walk in memory of the Holocaust and its victims. A man in a black BMW SUV drove by and yelled obscenities and insults against Israel and the Jewish people, local television station KSBW reported. A rabbi filmed as he was subjected to hateful and "vile" road rage abuse in Melbourne's south-east including being told he "should've died in Auschwitz". In the 20-second video, a middle-aged male passenger in a grey vehicle can be heard calling the rabbi a “f---ing selfish c--- of a Jew” as they sit stationary at a red light. He admits he’d picked up his mobile phone to make a call while stopped at a red light on the Nepean Highway, but never imagined it would spark death threats and anti-Semitic abuse. The rabbi said he moved to Australia five years ago for a peaceful life. He said the incident had left him questioning how something like that could happen in a modern Australia. Germany said Friday it had extradited to Sweden John Ausonius, the convicted killer known as the “the laserman” for using a precision-scope rifle to target immigrants. “He was extradited on Thursday,” Frankfurt state prosecutor Nadja Niesen told AFP. Ausonius, a 65-year-old Swedish citizen, has been found guilty of murder in both countries, most recently receiving a life term in Germany in February last year that was upheld on appeal in November. Previously he was already serving a life sentence in Sweden for a six-month shooting spree in 1991-92. Using the laser-scoped rifle, he had killed a 34-year-old Iranian man and wounded 10 other people from countries including Brazil, Greece, Syria and Zimbabwe. In a sign of Ausonius’s notoriety, Norwegian white supremacist mass murderer Anders Behring Breivik at his own trial mentioned the “laserman” as a figure who shared the same goals. Researchers at the Hebrew University in Jerusalem have developed a new and unique material that can bind the radioactive isotope Caesium-137 in water, thereby purifying it. This toxic isotope appeared after the nuclear explosion in Chernobyl in 1986, and the nuclear disaster in Fukushima in 2011. The new material is efficient, easy to prepare and does not require a large financial investment. The Hebrew University research was carried out by the doctoral student Raval Bengiat in the laboratory of Prof. Yossi Almog, in collaboration with Prof. Danny Mandler of the Institute of Chemistry at the Hebrew University, and will be published in February in Chemistry — A European Journal in February. One of the major problems with radioactive materials is pollution of soil and water with radioactive waste. This waste emits dangerous radiation even in minimal amounts, and its treatment is complicated and costly. Caesium-137 is able to be absorbed in bones and muscles. In fact, only half of the material will break down after 30 years, continuing to be a dangerous pollutant that emit radiation for decades. Cesium salts, such as sodium and potassium, are highly soluble in water and do not tend to react with many substances, which makes it difficult to purify water from cesium contamination. There are some chemicals that can bind cesium salts from aqueous solutions and sink them, but these are expensive and their use is limited. As city roads become more congested, two-wheeled vehicles gain popularity. They do, however, tend to be less safe than the four-wheeled metal boxes we call cars. Ride Vision Ltd. wants to make things safer, with the help of some computer vision magic. In 2016, in the US alone, 5,286 motorcyclists were killed in accidents, accounting for 14% of all traffic fatalities, while only amounting to 3% of all registered vehicles in the country, according to a report released last year by The US Federal Highway Administration. Founded in 2018 by Israeli motorcyclists Uri Lavi and Lior Cohen, Ride Vision utilizes a set of sensors, computer vision, machine learning algorithms, and visual alerts to notify riders when they are about to collide with surrounding vehicles. The system can also store videos documenting the ride that can later be used in insurance claims and in court. “Being more vulnerable, motorcyclists have to pay more attention to everything that goes on on the road. When a motorcyclist is focused on a car changing lanes on the left, he or she might not notice the car hitting the breaks just in front of them,” Lavi said in a phone interview with Calcalist. Scheduled to hit the markets next year, Ride Vision’s system will be priced at about $300, with an additional monthly fee for video storage. South Korea multinational Samsung Electronics Co. Ltd. has acquired Israeli startup Corephotonics, which brings high quality camera images to smartphones, for $155 million, Calcalist financial website reported on Monday. Corephotonics has developed a dual-lens phone camera that can produce crystal-clear images even when the zoom function is used. Because the parallel 13-megapixel lenses also have their own sensors, the camera boasts improved low-light performance, producing cleaner images. Essentially, by using two lenses with two different focal lengths, the phone camera is able to combine two simultaneous images into a high-quality image — much clearer and crisper than images produced with the digital zoom technology used in most smartphone cameras today. In other words, when a user takes a photo, the phone camera actually takes two shots: one with a wide angle lens, and one with a fixed-focus telephoto lens, both designed by Corephotonics. Using an algorithm developed by the company, the images are then fused into one crisp, clear photo that could as well have been taken with a higher-end 20-megapixel smartphone camera — or even a compact digital camera. Famous British chef Jamie Oliver was spotted in Tel Aviv’s Carmel Market, reportedly in Israel to film segments for a cooking show. The Naked Chef, as Oliver was lovingly known for one of his first cooking shows, hasn’t posted anything about an Israel trip on social media, keeping to his usual roster of recipes and cooking tips. But he was spotted by Nurit Goren, who runs tours in the Carmel Market and spends about 30 to 40 hours there each week. Goren was in the middle of a tour in the market this morning, when she received a call from the owners of Julie, an Egyptian restaurant in the market, which Oliver was visiting at that moment. Likud MK Yehuda Glick visited the Temple Mount on his wedding day, after surprising the Knesset last month by announcing that he intends to remarry. "The international place and center of love and peace," Glick wrote on Twitter on Monday, with the Temple Mount in the background. "I hope we continue to be God's vessel for love and good deeds in the world." Glick had been a widower for the past year after his wife, Yaffa, passed away last January. He surprised the Knesset by announcing that he will marry Hadas Disin, head of a foundation that helps orphans and widows. Disin is also a widow who lost her husband 17 years ago. Glick, one of the strongest advocates for expanding access for Jews to pray at and visit the disputed holy site, is famous for visiting the Temple Mount and insisting of its importance to Judaism. 1949 was a big year in the story of the great friendship between Australia and Israel. In this year, the Australian government recognized the young and brave State of Israel as an independent nation, formally cementing our diplomatic relationship. Two years earlier, Australia was the first country to vote ‘Yes’ to the 1947 UN Partition Plan that called for the establishment of a Jewish and Arab state – the first of many votes in the UN where Australia would stand firmly by Israel’s side. But Australia’s strong connection to Israel goes back more than a century. In 1917, Australian Lighthorsemen charged entrenched Ottoman machine gun positions in Beersheba in one of the last great cavalry charges. Their success led to rapid Allied advances in the Sinai-Palestine campaign and the capture of Jerusalem later that year – military victories that helped enable the creation of the State of Israel. We remain committed to Israel’s security. Australian soldiers serve on Israel’s borders, in the Sinai overseeing the crucial peace between Israel and Egypt as well as in the north on Israel’s borders with Lebanon and Syria. The Australia-Israel relationship is stronger than ever, continuing to expand into new spheres. Reciprocal prime ministerial visits reinforced the seriousness of our close connection and laid the groundwork for stronger security and defense ties. The Australian government’s recent decision to recognize Israel’s capital and establish a Trade and Defense Office in west Jerusalem and to appoint a resident defense attaché, demonstrate that we’re committed to broadening and deepening our relationship.